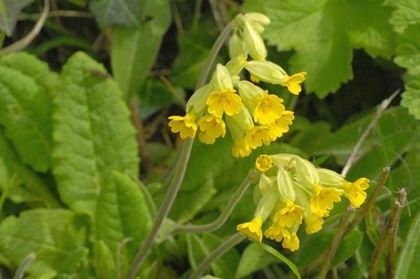 Cowslip is not easily confused with other wild plants on this web site. The good news is that this little plant, noticeably absent for some time, is now starting to make a come-back. 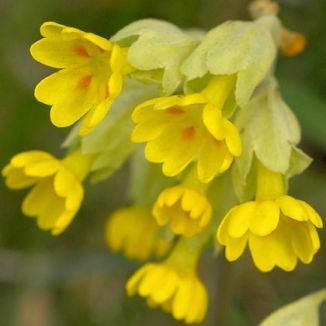 Its spread declined as a result of intensive farming and even over-picking, but now it is beginning to reappear on some roadsides and pastures. The yellow-orange flowers (8-15mm) nod in a one-sided umbel which is borne on a hairy, stout stem. The individual flowers are comprised of five joined petals, each flower bearing orange spots in the centre, and are scented. The bloom in April and May. The leaves are not unlike those of the Primrose in that they are wrinkled and hairy, forming a basal rosette. Like the Primrose, there are two forms of this flower. (See Primrose). One of fifty-six species which are given special protection in Northern Ireland under the Wildlife (NI) Order, 1985, this plant is now quite rare in Great Britain due principally to being overpicked and dug up for gardens. My earliest record of this wildflower is picking it in the early 1950's in Dundrum, Co Dublin (not recommended these days!) and I photographed it in Glenmalure, Co Wicklow in 1999. There I couch when owls do cry'. The Tempest. William Shakespeare 1564-1616. The flowers of this plant make a very good wine.